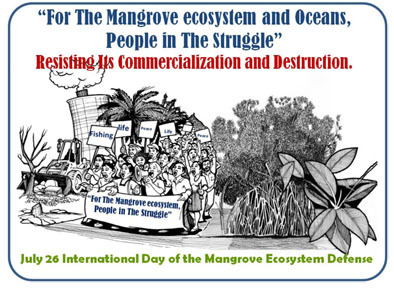 “For The Mangrove ecosystem and Oceans, People in The Struggle”. “Resisting Its Commercialization and Destruction”. When the mangrove ecosystem are destroyed, important breeding areas and refuge of many species that use their roots for safe keep and procreation are lost. The mangrove and oceans are important areas and territories of biodiversity that sustain life in townships, in spite of that, industrial fishing, oil exploration, natural gas projects, mining exploration in the ocean beds, coastal areas and beaches, as well as, industrial aquaculture of fish and shrimp and contamination are some of the toughest threats to these ecosystems. In many parts of the world, communities and towns have undertaken arduous battles to protect their collective rights and natural heritage. Resisting the commercialization and destruction of the ecosystems, from the megaprojects, under the tentacles of transnational’s or ntrepreneurships urged by national businessman with the support of local and national government authorities, whom in many cases twist or create laws to suit their needs to approve projects or studies of environmental impact. The local communities continue the fight and resistance! Redmanglar International, takes advantage on July 26, to pay tribute to the men and women that have relentlessly defended their land, their mangrove swamps, their oceans and their food sovereignty. To all of them our acknowledgement and solidarity. Redmanglar International, calls upon all and every base community organization, fishing, weighers, organized communities, civil organizations and media to join this celebration. Of course the mangrove ecosystem defense activities are very much appreciated.Thank you for your effort.